As we close the books on another season we celebrate the accomplishments of our players and teams. These accomplishments will be marked by both banners and moments. A championship won is a great memory but should share an exalted place in the long run beside the successful acquisition of a new skill, an increased level of confidence or a new friendship. It is all of these things that make us proud to be the club that we are. As we look forward to our next decade we actually find ourselves most likely saying goodbye and good luck to the last birth year of players and families who have been with us from the beginning (unless they like me decided to have more mites). In light of this transition, and with a great sense of pride for who we are and what we are about, I am happy to announce the first annual Admirals Awards. These awards are not just about individual recognition, they are about clearly stating and preserving our club values. The last award is one which has a great deal of personal meaning to myself and many other long-time members of the Admirals Hockey Club. This is the Ross K. MacNeill Memorial Award. Ross was a dear friend and Admiral who fought a long and courageous battle against pediatric brain cancer while playing for our club. His compassion for others, his love of the game, and his constant smile through his ordeal was a challenge to all of us to see the good in life and to remember that we always should have enough time and energy to make the world, and the lives of others, better. It is our hope that through this award we can keep his meaningful legacy and example alive in the hearts and minds of the next generation of Admirals players and families. For more information on Ross and the foundation founded in his name please visit r33m.org. We hope to weave all of these awards and the ideals they represent into the fabric of the Admirals Hockey Club. We want to encourage a culture that celebrates character and personal growth as much, if not more, than banners, trophies or a line on the scoresheet. We thank you for being a part of our Admiral family. Awarded to the Admirals hockey player who best demonstrates commitment to hard work, sportsmanship, leadership, respect and compassion for others both on and off the ice. The recipient of this award puts others before themselves, and seeks opportunities to have a positive impact on their community. This is the highest award the Admirals bestow and honors the memory of Ross K. MacNeill, the Admiral who in the midst of his own struggles gave all of himself to others and exemplified the highest ideals of leadership and self-sacrifice. Admirals Hockey Club Award Recipients! 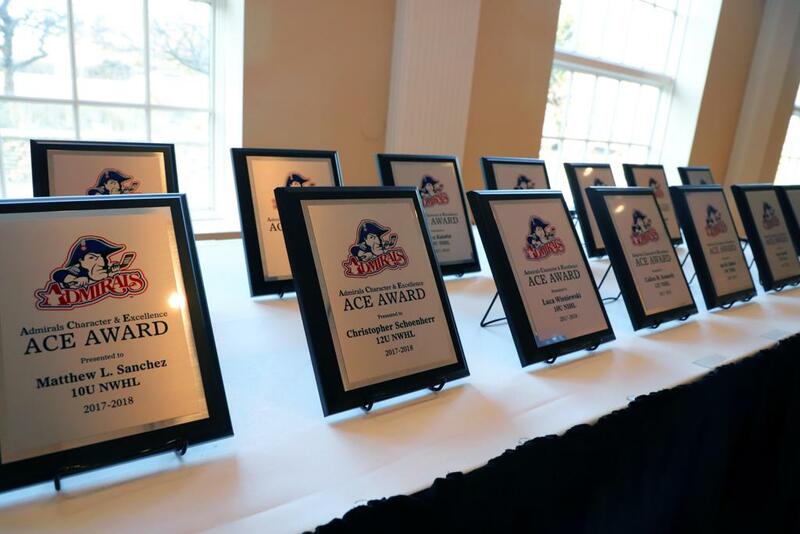 Awarded to a player who best demonstrates the ideals of the Admirals Hockey Club; consistent improvement in hockey skills, outstanding sportsmanship, teamwork, personal integrity, coachability and leadership. Awarded to an Admirals Coach who best demonstrates the ability to develop and improve player and team performance through promoting hard work, sportsmanship, teamwork, and leadership both on and off the ice. Awarded to an Admirals volunteer in appreciation for their outstanding and dedicated service to the Admirals Hockey Club.